Over the last few months, Twitter and HootSuite came together on collaborative webinars to explain some fundamental uses of Twitter for small to medium-sized businesses. Our most recent webinar, How to Turn Leads into Customers on Twitter, offered tips and best practices for driving leads on Twitter, and tying your business success directly to your social media efforts. During the webinar, our well-informed followers asked a number of valuable questions on topics ranging from lead generation to follower categorization. Here are 10 of the most popular audience questions, answered to help you succeed with Twitter for business. 1. What is the best way to get more Twitter followers? The first step to gaining more Twitter followers is to import your contacts. These are people with whom you’ve already made a connection, so they’re far more likely to follow you back. Then you should use search.twitter.com or HootSuite search to find users and #hashtags that are relevant to your business, then reach out and engage. Promoted Accounts is another means of helping you target those who would be interested in your business but don’t yet know that you’re on Twitter. A final means of attracting followers is to advertise your Twitter handle in other marketing efforts, including print and broadcast media. 2. Is there any research on the optimal amount of Tweets, how many per week, month, time of day, etc.? This is one of the most common questions we get and the answer is there is no universal optimal number of Tweets per day — it depends on your business. What is very important is that you keep up a regular cadence of tweeting. It’s better to Tweet less every day but make sure it’s done regularly that to Tweet more often but sporadically. People will want to follow you and your Tweets if they know that you are consistently posting about a specific subject area. 3. Are there any tools that can help you categorize your followers (i.e. lists) that you can then target to? Twitter followers can be separated into lists and streams based on subject, company or any other common factor to help you categorize them. Followers can also be filtered by klout score, allowing you to separate the most influential social media users for further engagement. As such, categorizing followers is a great way to find high-quality content that you can curate and share. For more on creating HootSuite streams, click here. 4. What does SMB stand for? 5. How can I identify influencers on Twitter? As previously mentioned Followers can be filtered by klout score, allowing you to separate the most influential social media users. Also, when using search.twitter.com to look for keywords and hashtags, the “top” category highlights the most influential users talking about those particular subjects. 6. What is the best way to tweet long URL’s? Long URLs can easily be shortened using a URL shortener like ow.ly, which is accessible within the HootSuite dashboard. Shortening these links also makes them trackable, meaning you can see how many times a URL is clicked along with other analytics options. For more information on shortening URLs, click here. 7. What are lead gen cards and how do you set one up? Twitter Cards enable you to provide rich experiences and useful tools to users within an expanded Tweet. With the Lead Generation Card, people can express interest in your products, services or offers without leaving Twitter or having to fill out a cumbersome form. When someone expands your Tweet, that person will see a description of your offering and a call to action. The user’s full name, @username and email address (previously entered in Twitter account settings) will be pre-populated within the Card. With a simple click of a button, the user can send this information to you directly. Select the Cards option under the Creatives tab within your Twitter Ads account. Make your Lead Generation Card accessible to users by attaching it to a Tweet. To do this, click the blue Tweet button in the upper right corner of any page within your Twitter Ads account. Then select the Cards icon at the bottom of the Tweet dialog that opens and choose one of the Cards you’ve created. When you’re ready, click Tweet. Promote your Lead Generation Card and reach more users by adding the Tweet you’ve just created to any existing Promoted Tweets campaign. You can also create a new Promoted Tweets campaign and select your Card-containing Tweet. Download your leads as they accumulate within your Twitter Ads account. Simply click on the Download icon in the bottom right corner of your Lead Generation Card to get a CSV file containing your lead information. 8. How can I measure conversions on Twitter? An easy way to measure conversion is to use a Twitter specific coupon code to see who redeemed and got it the info from Twitter. 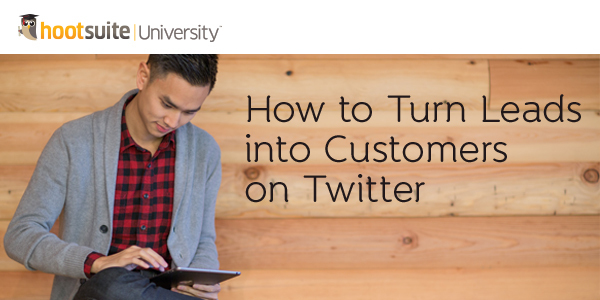 For a more advanced way check out Twitter’s online conversion tracking. Another way to track conversions using HootSuite is to use link parameters, which allow you to track analytics for specific URLs sent to your social media profiles. Start by opening the HootSuite compose box, insert the link you want to share, and click on the gear icon to open the advanced settings. HootSuite allows you have preset parameters that can be applied on the fly to any link, or assigned to all links by default. “Google Analytics” is also set up as a default preset, which you can customize or add more as needed. For more on using HootSuite link parameters, click here. 9. Can a brand new user be successful with Twitter Ads or do you need a lot of followers? How do Twitter Ads work? Twitter’s Promoted Products can help an account at any stage of the process help grow their business. It doesn’t matter if your account if fairly new. The key to Twitter Ads is to make sure you know what content would work for your audience and which people you would want to target. Analyze what posts have worked best on your Twitter page, and put advertising money behind them to amplify their reach. How do you know which of these types of Twitter posts are working best for your business? Twitter Insights, Twitter’s native analytics tool, can provide insight, no pun intended, into your content strategy. You can gain this through our ads platform for free. Choose your target audience — reach the right audience by targeting based on interests, geography, gender, device, or users similar to your followers. In addition, maximize the relevancy of your message by targeting by keywords in people’s Tweets. Promoting your account is one of the quickest way to build an active community of advocates and influencers for your business. The bigger your follower base, the more people there are to engage with and spread your message. Using our Promoted accounts in Timeline also lets you tell followers why they should follow you. Promoted Tweets are regular Tweets but with the added bonus of reaching both current and potential followers you target. Use them to amplify a specific promotion, sale or event when you want to reach the widest audience. Set a budget and pay for what works — only pay when users follow your account or retweet, favorite, reply, or click on your Promoted Tweet. You’re in complete control. There’s no minimum spend, and you can start and stop at any time. 10. How can you schedule tweets for a future date? Scheduling Tweets is not as difficult as it sounds. Within the HootSuite dashboard, you type in your message and include any links you might need, then hit the little “calendar” icon. This allows you to choose a date and time to schedule your Tweet. You can also bulk schedule up to 350 posts at one time using an excel document. A final scheduling option is autoscheduling, which allows the HootSuite dashboard to choose times to send out Tweets on your behalf. Learn more about all 3 types of scheduling here. Scheduling is also available in ads.twitter.com. Here at HootSuite, we’re dedicated to helping our millions of customers learn as they grow. This includes education through our blog, on-demand webinars, training and education. We offer free coaching services as part of our HootSuite Pro plan and also deliver on-demand education and training through HootSuite University.